But as with other biology-inspired stuff, neural networks in particular, what ultimately becomes useful in computer science/engineering may not be that closely related to the way biology actually works. So what I want to ask here is: are there some detailed mass-and-heat flow analyses for how the brain (of humans or even of other mammals) is actually cooled? How is most of the heat exhausted from the brain? Is it really thorough blood, and then globally through the whole body? Or is mostly a more local process at head level? The second influence of the blood flow is that it can enhance heat dissipation from the inside of the body to the environment to maintain a normal body temperature. Theoretical study has shown that if the heat produced in the central areas of the body at rest condition could escape only by tissue conduction, the body temperature would not reach a steady state until it was about 80°C. A lethal temperature would be reached in only 3 hours. During exercise, our body temperature would have typically risen 12°C in 1 hour if no heat were lost by blood flow. Maintaining a core temperature of 37°C during thermal stress or exercise in the body is achieved by increasing the cardiac output by central and local thermoregulation, redistributing heat via the blood flow from the muscle tissue to the skin, and speeding the heat loss to the environment by evaporation of sweat. So from that I suspect blood is surely important for cooling the brain as well, but still some questions remain, e.g. where does most of the heat from the brain get dumped by the blood? In more layman's terms: is the rest of the body necessary as a radiator for the brain, or is the skull enough for that purpose? The question whether SBC also operates in humans, who lack cranial retia mirabilia, has led to an interesting controversy. For some authors (Brengelmann 1987) the copious and constant arterial blood flow to the brain appears sufficient to cool the brain under all conditions. Others (Cabanac 1993) concede that this concept may be correct for the conditions at normothermia, but they propose that an additional brain-directed cooling mechanism becomes effective during hyperthermia. These authors draw attention to vascular arrangements in humans, which permit effects comparable to SBC in "rete species". Cabanac (1993) points to several sites of intimate thermal contact between the arterial and the cooler venous blood, e.g., the internal carotid in the carotid canal, where the artery is tightly surrounded by the venous plexus caroticus and thereafter immersed in the cavernous sinus, and the vertebral arteries surrounded by a plexus of veins where they course through the transverse foramina (see our Fig. 14). Furthermore, Cabanac refers to the high cooling capacity of the skin of the head (particularly rich in sweat glands), whence venous blood, cooled by sweat evaporation, flows via emissary veins towards the brain in hyperthermic situations (Caputa et al. 1978; Cabanac and Brinnel 1985; Deklunder et al. 1991; Hiroshita et al. 1991). An additional loss of heat occurs in the upper airways (Cabanac 1993), including the paranasal sinuses. 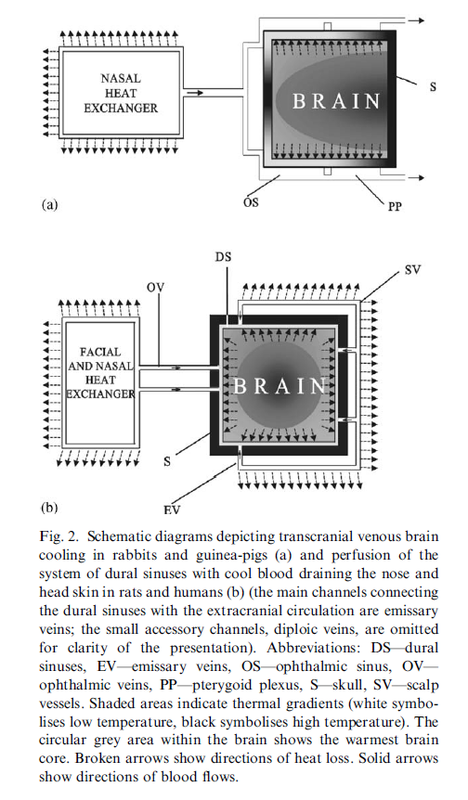 A direct conductive skin-brain heat exchange has also been considered. The existence of effective SBC in humans has not been proven directly because brain temperature has never been recorded in healthy subjects exposed to hyperthermic conditions. [Cerebral blood flow] CBF is most critical for maintaining and stabilizing the thermal environment of the brain. Under normal conditions, cerebral tissue beyond 2–3 cm from the cortical surface remains unaffected by changes in ambient temperature surface without simultaneous temperature changes in the perfusing blood (Stone et al., 1997). Core brain temperature is generally higher than body temperature; with blood temperature in the jugular vein higher than in the carotid artery (Nunneley and Nelson, 1994), CBF primarily contributes to heat removal from brain tissue. The superficial parts of the brain, however, are much more susceptible to the ambient temperature and may be cooler than arterial blood, particularly in neonates and infants (Iwata et al., 2014). Primate studies demonstrated that shifts in temperature, 5–7°C on either side of the neutral zone (28 and 32°C), did not affect deep brain structures, while superficial sites and CSF of the basal subarachnoid space were reported to change (Hayward and Baker, 1968). CBF, therefore, is critical in maintaining intracranial thermal homeostasis by reducing temperature in the deep brain but sometimes increasing temperature in the superficial brain (Iwata et al., 2014). In many non-human mammals and birds there's evidence for a mechanism that allows the brain to be cooler than the rest of the body. This mechanism, called SBC (selective brain cooling) has actually several flavors, but all seems to involve just head-level "radiators" like the nose. Actually, artiodactyls, which have the most effective mechanism of SBC, are able to tolerate extremely high body temperatures. Taylor (1970) has shown that heat stressed and water deprived Grant’s gazelles are able to maintain rectal temperature at 46.5C for as much as 6 h with no observable ill effects. Surprisingly, rectal temperatures as high as 46.5C (Khogali and Mustafa, 1984) and 47.0C (Hart et al., 1982) have been recorded also in humans who survived heat stroke. If SBC were absent, such high temperatures would be inevitably lethal. 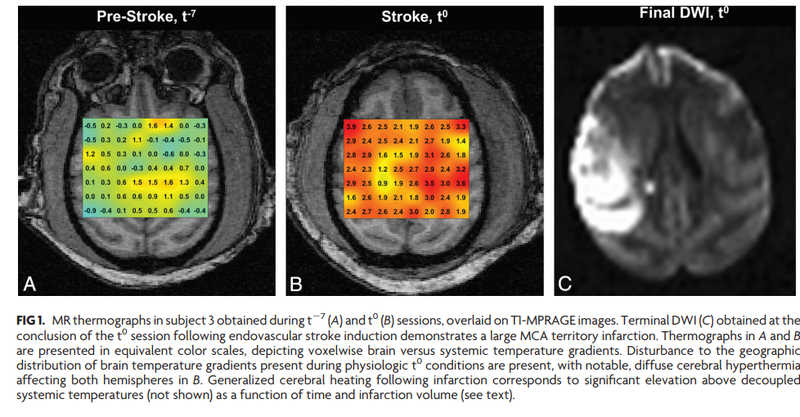 Brain thermoregulation remains an enigmatic process reflecting the complex interplay of metabolism and cerebrovascular perfusion. The paper goes into some detail into hypotheses of why this raise happens, how much it contributes to stroke propagation etc., but there aren't any firm answers. What is clear is that the brain can lose its ability to thermoregulate, relative to the body.